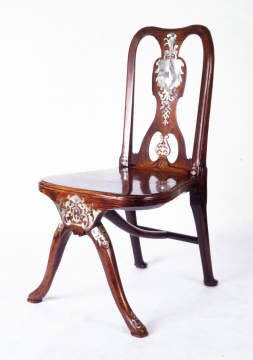 Chair, one of a set of eight including XF296-XF303, Cantonese, c.1725-35, rosewood (Dalbergia) inlaid with mother-of-pearl. ©Sir John Soane's Museum, London. Photograph: Hugh Kelly. One of a set or eight with XF297, XF298, XF299, XF300, XF301, XF302 and XF303. 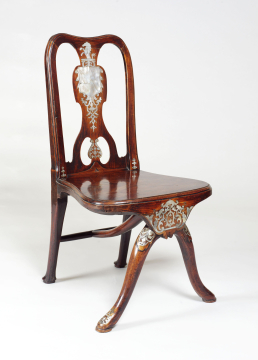 With hooped backs, dished top rail and single splat; splayed front legs with pad feet, the knees decorated with lambrequin ornament with acanthus; the aprons with a central cartouche flanked and surmounted by acanthus scrolls; curved struts extend from the apron of each chair to the back stretcher with a bracket from this to the base of the centre of the front apron; the chairs originally had cane seats which have been replaced by thin mahogany. 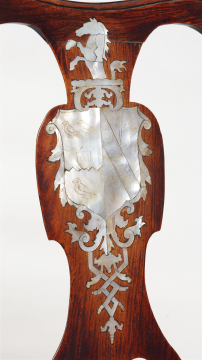 The splats are inlaid with a coat of arms, each composed in a slightly different way, with different elements either made from separate, inlaid pieces of mother-of-pearl, or engraved onto larger pieces; the engraved decoration has traces of mastic, originally used to embolden the lines, surviving in many places. The bottoms of the back uprights, the splats and the tops of the feet inlaid with further floral motifs. These chairs conform to an English pattern with a splat and a dished top rail with a moulding running round, but with various non-European features. In order for such furniture to be produced, patterns and models of European furniture were sent out to the Far East for copying by Chinese makers. The joinery has certain characteristics of Chinese cabinet-work, in particular the ‘cogged scarf joint’ which joins the sections of the seat rail, the way the seat-rail is through-tenoned and pinned to the rear upright (no European chair would have diagonal joints such as those on the corners at the top of the back), the absence of a shoe for the base of the splat, the beaded edge to the seat and uprights and the rather rough-hewn aspect of the S-shaped seat brace.2 The quality of the mother-of-pearl and the way it is incised recalls the Chinese gaming counters, often decorated with armorial designs, which were a staple of the China trade in the eighteenth century. The demolition of Wricklemarsh, one of the great private palaces of the eighteenth century, attracted much attention. Soane ‘went to Sir Gregory Page's to look at materials’ on 29 May 17878 and bought salvageable building materials at the sale on behalf of one of his clients, Robert Fellowes of Shotesham, presumably for use there.9 This Journal reference has led previous researchers to assume that Soane must have acquired the eight Chinese chairs at the same time, in 1787, but they are more likely to be from the set of ten that were included in the 1783 sale. All eight chairs were restored by Spink Restoration in 1990 under the direction of Peter Holmes. 1 I am very grateful to Andrew Waters and Michael Hardy of Christie’s for this information. ‘Heath’ is only recorded as a purchaser on the fourth day of the sale and his other purchases were very insignificant. He may have been the dealer Abraham Heath who was active in the London market at this time. The chairs do not appear in the posthumous sale of his stock-in-trade held by Phillips, 24 and 26 May 1800, but he may have sold them earlier. No trace of a purchase from a ‘Mr. Heath’ can be found in the Soane Archive. NB Three Wricklemarsh sales were held, 1775, 1783 and 1787. 2 SM object file, letter from Craig Clunas, then of the Far Eastern Department of the V&A, October 1981. 3 Information from Craig Clunas. 4 C. Clunas, ‘Design and Cultural Frontiers: English Shapes and Chinese Furniture Workshops 1700-90’, Apollo CXXVI: 308 (Oct 1987), pp. 256-63. 5 SM object file, letter from Dr. Bowett to Tim Knox, December 2005. 6 The sale was conducted by Christie’s from 28 May to 6 June. Soane’s great friend J.M.W. Turner produced a watercolour of the house as a ruin, now in Leicester Museum, see J. Brushe, ‘An Early Turner Water-Colour Identified’, Burlington Magazine, Vol. 117, No. 862 (January 1975), pp. 48-51. 7 Soane only acquired eight of the original ten chairs. 8 SM Archive, Soane Journal 1, f.20 facing page. 9 Soane paid Christie’s £178.15.0 for his purchases on 16 July. They included two chimneypieces and some floorboards. SM Archive, Soane Journal 1. Wricklemarsh House, Blackheath, Kent. Sold Christie’s, 23 April 1783 and five following days. Fourth day, 26 April, Lot 50; sold to ‘Heath’ for £2.19.0.1 In Soane’s collection by 1821-22.